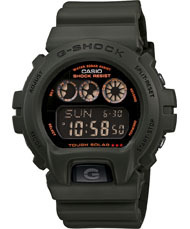 Based on the success of its G-Force series, G-SHOCK introduces another set of military inspired watches, but this time around, dressed in olive green and utilizing solar power. These watches have reverse LCDs and are highlighted with subtle action orange color accents. Olive green resin band digital watch with black face.